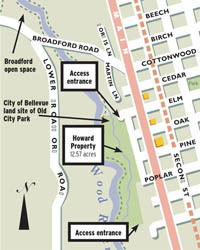 The city of Bellevue and the nonprofit Wood River Land Trust are seeking $135,000 from Blaine County’s Land, Water and Wildlife Program to complete a land sale and swap to increase the size of the Howard Preserve riparian park along the Big Wood River. The Howard Preserve is on the west side of downtown Bellevue. The Land Trust bought 1.5 acres of private property near the river at the south end of the preserve last year, between Poplar and Walnut Streets. Along with that purchase came two vacant Main Street lots that the Land Trust has no use for. “We have always planned to leverage them for future conservation purposes,” said Chad Stoesz, stewardship coordinator. Stoesz said the Land Trust would like to donate the two Main Street lots to the city. The lots would then be combined with $135,000 from the county’s Land, Water and Wildlife Program to exchange for four river lots (about one acre) at the north end of the Howard Preserve, belonging to Mick Halverson. As part of the deal, Halverson would end up with the two Main Street lots and the $135,000. Stoesz said the four river lots at the north end of the Howard Preserve would be owned by the city, but placed under a conservation easement intended to protect the property from development. The county will review the land-swap application in September. The Blaine County Land, Water and Wildlife Levy was funded in 2008 by a two-year, $3.4 million assessment on county property taxes. Levy funding was set aside to help protect clean water in the Big Wood and Little Wood River watersheds, preserve fish and wildlife habitat, and to protect working farms, ranches and open space. The grant funds are awarded by a nine-member citizen committee after an extensive application process.